Starbucks District Manager Margaret Houston presents an apron to partner Glen Cole at Starbucks first U.S. Signing Store in Washington D.C. (Joshua Trujillo/Starbucks). The store was remodeled to maximize light and open lines of sight — high top tables or tall stacks of cups, for example, limit visibility for people signing to each other. Other changes were also made. WASHINGTON — The storefronts along Washington, D.C.’s bustling H Street Northeast are lit up with familiar names and logos: Petco. Whole Foods. CVS. There is also a Starbucks. Or, more specifically, S-T-A-R-B-U-C-K-S spelled out in the hand symbols of American Sign Language (ASL). That finger spelling is one way to spot the coffee giant’s first U.S. signing store, where 24 deaf, hard-of-hearing and hearing employees run the shop using ASL. The store debuted Tuesday after being converted from a standard Starbucks location to make the design and technology more accessible. It’s a step, employees and advocates say, toward boosting employment opportunities for the deaf community while also immersing hearing individuals in deaf spaces. And it’s a show of support from one of the world’s largest corporate brands. The store is just blocks from Gallaudet University, a 150-year-old institution and the world’s only university designed for deaf and hard-of-hearing students. The shop mirrors Starbucks’ first signing store, which opened in Kuala Lumpur, Malaysia, in 2016. Customers from the outside can spot “Starbucks” written out in finger spelling beneath the main logo and on large table umbrellas. And on the inside, what may appear like any other Starbucks cafe has been specifically laid out and decorated to celebrate deaf culture. One entire wall, for example, is covered by a multicolored mural commissioned by a deaf artist and Gallaudet faculty member. In finger spelling, the mural depicts a lowercase “d,” representing deafness, an uppercase “D,” representing deaf identity, an eye to represent visual connections, a hand holding a coffee cup, and other symbols showing merging of deaf and hearing cultures. Customers can communicate in ASL or write their orders on a tech pad. Rather than wait to hear their names called at the end of the bar, customers look up to a screen showing when their drinks are ready. The store was also remodeled to maximize light and open lines of sight — high top tables or tall stacks of cups, for example, limit visibility for people signing to each other. Nonsigning customers are also encouraged to use visual cues. Rather than sign that the store didn’t carry camomile tea, for example, one employee waved his hand across his neck — signaling “no” — and then pointed to a printed menu with other options. Store manager Matthew Gilsbach moved from California’s Bay Area to run the signing location. At one point in his three and a half years at the company, Gilsbach said he was stunned to meet a deaf Starbucks district manager. 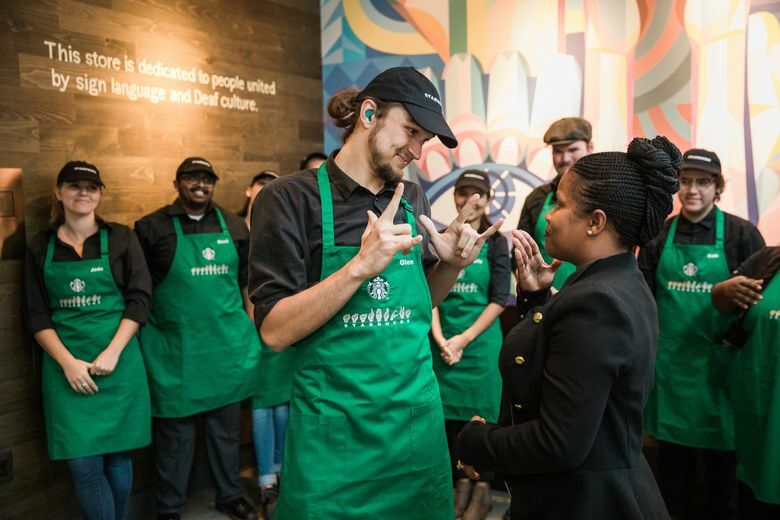 Any disbelief that a deaf person could take on a management or executive role is precisely the kind of stigma Starbucks and deaf community advocates aim to combat. Howard Rosenblum, chief executive of the National Association of the Deaf, said that companies may hire deaf employees at lower levels, but those opportunities rarely extend up the chain. Some companies show signs of progress: Microsoft’s chief accessibility officer, Jenny Lay-Flurrie, is deaf and has fought to expand accessibility for employees with disabilities. Still, the deaf community’s rate of unemployment and underemployment sits at a staggering 70 percent, Rosenblum said. “The manager is always a hearing person because there’s a perception of limited ability with deaf people,” Rosenblum said. Not so at the H Street Starbucks. Employee Kylie Garcia had just been promoted from a barista to a shift supervisor. Garcia grew up as the only deaf individual in a nonsigning, hearing family, and she knows firsthand how difficult it is for deaf people to find jobs. Garcia previously worked in a Starbucks kiosk at a Target store where her sole job was to make drinks — never interacting with customers and often being shut out of conversations with other baristas. “People turned down offering me jobs because they aren’t willing to take the risk,” Garcia said. Pamela Pipes, a hearing barista who is also a sign-language interpreter, moved from Raleigh, North Carolina, to work at the D.C. signing store. Here, “the tables have turned,” Pipes said, in that hearing customers are going to have to figure out how to navigate and communicate in deaf spaces. Sitting across from her, Harris joked that during phases of the remodel, some customers were still stumped. A few waited to hear their names at the end of the counter. Another walked in and, as if to signal that he wanted a large drink, held his hands in front of him about 2 feet apart. The store will continue to collect feedback from customers and employees, and Starbucks may eye another city for the next signing store. But this week, Novsam saw a dream fulfilled. Two nights before the Starbucks opening, Novsam walked down H Street to see the mural beaming yellows, pinks, greens and blues.